The above screen is the first shot from EA's Battleforge that shows off the game's DirectX 11 support. The game's developer and EA have announced that Battleforge is the first game to feature DX11 support, though you'll still need a DX11 card to take advantage of that. Currently only Radeon 5870 and 5850 cards support it. Remember that Battleforge is a game that's free to play, so if and when you do get that shiny new DirectX11 card, you can show it off without even purchasing a new game. And if you do make the investment, consider picking on up for a friend, it's the co-op thing to do. Everyone needs a little high definition ambient occlusion in their life. Redwood City, CA. 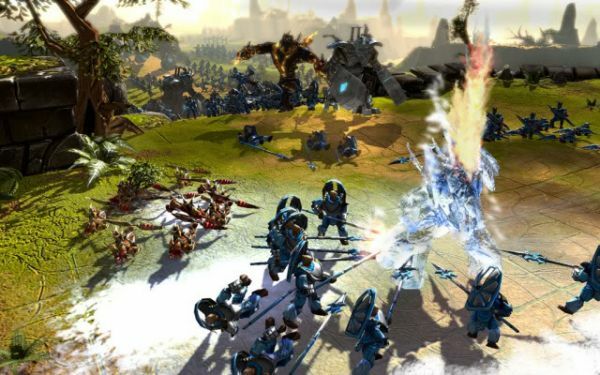 – October 5, 2009 – Phenomic™, an Electronic Arts Inc (NASDAQ: ERTS) studio, today announced that the Real-Time Strategy (RTS) game, BattleForge™, is the first title to leverage Microsoft’s DirectX® 11 and AMD’s new ATI™ graphic processor chipset. BattleForge players will now experience unparalleled graphic performance and even richer visuals including DirectX 11 specific features like high definition ambient occlusion (HDAO). BattleForge is available as a free* download at www.battleforge.com. BattleForge is a Play4Free game that combines strategy, fantasy, trading cards and magical spells in a dynamic online environment. Combining the strategic, real-time gameplay of classics such as Command & ConquerTM with a fully enabled, online collectible community, BattleForge pioneers strategy gaming with its online multiplayer design and community features set. The collectible cards in the game are the tools of war - each representing a spell, unit or building that is conjured directly onto the battlefield real time in stunning 3D graphics. BattleForge features single-player scenarios and cooperative scenarios supporting 2-12 players, as well as Player vs. Player (PvP) ranked and unranked duels. With co-op play, chat rooms, and a robust marketplace featuring direct trade, an auction hall and in-game mail, BattleForge is the first RTS to combine the social and community aspects of an MMO with an exciting RTS.